ROME, Jun 16 2013 (IPS) - Development in Africa will only be led through agriculture, says the CEO of the New Economic Partnership for Africa’s Development (NEPAD), Dr. Ibrahim Mayaki. Speaking to TerraViva at the opening of the weeklong 38th conference of the U.N. Food and Agriculture Organisation (FAO) in Rome on Saturday, Mayaki stresses that two-thirds of Africa’s population depends on agriculture, and it should therefore be placed at the centre of the multi-sectoral approach towards development. Agriculture and food security are at the heart of the discussions in the Italian capital, where FAO member states are gathered at the biennial conference. According to the 2013 edition of FAO’s flagship report The State of Food and Agriculture, Africa leads the world with the highest prevalence of undernourished people, at nearly 23 percent of the population. Liberian Ministry of Agriculture official Dr. Charles McClain attributes the high number of hungry people in Africa to national budgetary constraints. “Our revenue as a continent is not where it should be so that we’re able to adequately invest in agriculture,” McClain says. Despite the Maputo Declaration in 2003, in which African heads of state committed to a 10-percent allocation to agriculture, the continent remains far from achieving food security. Of the 54 African Union member states, just 10 have met this commitment. “For instance, my country [Liberia] allocated only 2.4 percent [of the budget] to agriculture in the last financial year and it went down to 1.4 percent this year. We’re a country that’s recovering from war and we don’t have the resources,” McClain says. To make up for the shortfall, Liberia – like many other African countries facing similar challenges – has turned to the donor community. 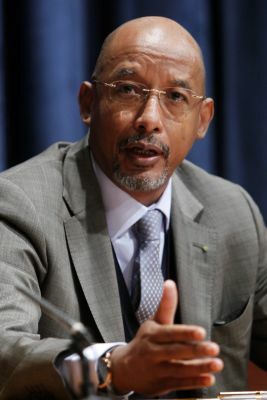 While Mayaki cautions that it will take time for the continent to make genuine progress on malnutrition, NEPAD’s Comprehensive Africa Agriculture Development Programme (CAADP) is providing countries with mechanisms and policies to realise this goal. This could be achieved through empowering small-scale farmers to become entrepreneurs so that they can sell and buy food, he says. Mayaki also called for the empowerment of civil society organisations so that they are able to shape the priorities of the state.